Received: December 11, 2018; Accepted: December 13, 2018; Published online: December 30, 2018. We report the case of a man who presented with lentigines and dyschromia on the face. Treatment was carried out using combined therapy with intense pulse light, picosecond neodymium:yttrium-aluminum-garnet (Nd:YAG) laser, and superficial chemical peels. No side effects or complications from treatment were noted. The patient had very good cosmetic results with this combined technique. Combined treatment with intense pulsed light, picosecond Nd:YAG laser, and superficial chemical peels can safely and effectively improve facial lentigines and dyschromia. 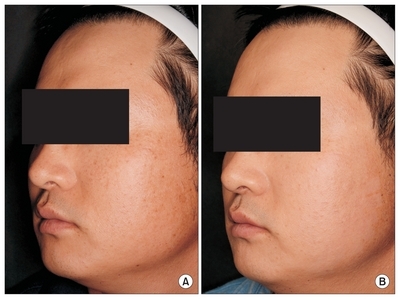 In this report, we describe a case of photoaging which are successfully treated with triple combination treatment using IPL, picosecond laser and superficial chemical peels. A 39-year-old man presented to our clinic with lentigines and dyschromia on the face. Physical examination revealed brownish macules, rough skin texture and fine wrinkles on face, especially on cheek area (Fig. 1A). After initial evaluation, we recommended combined treatment with IPL, picosecond laser and superficial chemical peels. Before treatment, an explanation of the risks, benefits, and potential complications of the procedure were given, and written informed consent was obtained. Anesthesia was achieved with a topical EMLA cream (AstraZeneca AB, Södertälje, Sweden) for 30 minutes before treatment. At first, picosecond 1,064-nm neodymium:yttrium-aluminum-garnet (Nd:YAG) laser (PicoWay®; Syneron Candela Corporation, Wayland, MA, USA) with a spot size of 6 mm and a fluence of 0.5 J/cm2 was applied to treat the patient until producing a slight redness. After that, the patient was treated with 500–670 nm & 870–1200 nm IPL (Icon®; Hologic, Westford, MA, USA) with 34 J/cm2. Then we treated him with a superficial chemical peel (Facial Infusion; Osmosis LLC, Evergreen, CO, USA). The patient tolerated each procedure well without complication. He was instructed to wear a broad-spectrum sunscreen. After one session, he showed more than 75% improvement from baseline in skin pigmentation and he was satisfied with the results (Fig. 1B). The most obvious aging sign in the Asian population is skin color changes especially pigmentation rather than wrinkles or vascular problems.3 The color changes of the skin are also related to the stratum corneum of the skin, melanin, blood vessels, and degeneration of collagen and elastin. Therefore, to treat these changes, a combination therapy is more effective than a single treatment in clinical practice. The authors have declared no conflicts of interest and no funding sources. Fig. 1. (A) Before treatment: remarkable lentigines and dyschromia on the cheek. (B) Significant improvement of the skin pigmentation after one treatment. Chung, JH, Hanft, VN, and Kang, S (2003). Aging and photoaging. J Am Acad Dermatol. 49, 690-7. Li, YH, Wu, Y, Chen, JZ, Gao, XH, Liu, M, and Shu, CM (2008). Application of a new intense pulsed light device in the treatment of photoaging skin in Asian patients. Dermatol Surg. 34, 1459-64. Negishi, K, Akita, H, and Matsunaga, Y (2018). Prospective study of removing solar lentigines in Asians using a novel dual-wavelength and dual-pulse width picosecond laser. Lasers Surg Med. 50, 851-8. Bitter, PH (2000). Noninvasive rejuvenation of photodamaged skin using serial, full-face intense pulsed light treatments. Dermatol Surg. 26, 835-42. Weiss, RA, Weiss, MA, and Beasley, KL (2002). Rejuvenation of photoaged skin: 5 years results with intense pulsed light of the face, neck, and chest. Dermatol Surg. 28, 1115-9. Gao, L, Gao, N, Song, W, Dang, E, Yin, R, and Wang, L (2017). A retrospective study on efficacy of pulsed dye laser and intense pulsed light for the treatment of facial telangiectasia. J Drugs Dermatol. 16, 1112-6. Nam, JH, Kim, HS, Lee, GY, and Kim, WS (2017). Beneficial effect of low fluence 1,064 nm Q-switched Neodymium:Yttrium-Aluminum-Garnet laser in the treatment of senile lentigo. Ann Dermatol. 29, 427-32. Vemula, S, Maymone, MBC, Secemsky, EA, Widjajahakim, R, Patzelt, NM, and Saade, D (2018). Assessing the safety of superficial chemical peels in darker skin: a retrospective study. J Am Acad Dermatol. 79, 508-13.e2.